The meta-meta-model in webgme describes the syntax for the meta-models. Below follows a short description and a video elaborating on each concept defined in the meta-meta-model. To follow this tutorial it is perfectly fine to skip Sets, Mixins, Aspects and Constraints. This entire section can also be seen as a reference manual and it’s recommended to return to these when creating the meta-model. Enumeration, min, max, regex, multiline, etc. Meta properties are properties that are typically set on meta-nodes with main purpose to guide/constrain the end-user while modeling. 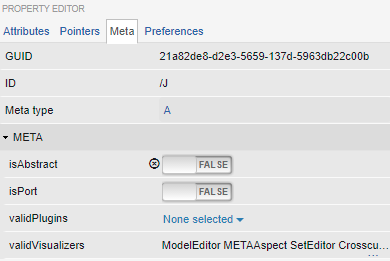 In contrast to the other concepts they are not defined using the Meta Editor, instead they are set in META tab in the Property Editor. A port node will visually be elevated to the border of its parent. A list of plugins that can accepts the node as active-node. Which visualizers should be listed for the node and which one should be opened when navigating to it.